After seven seasons, some 1,400-odd episodes, two Emmys, and one huge sexual misconduct story, ABC has opted to spit out The Chew. Deadline reports that the daytime program is getting sent back to the kitchen in favor of a third hour of Good Morning America, a change which will take effect beginning in September. 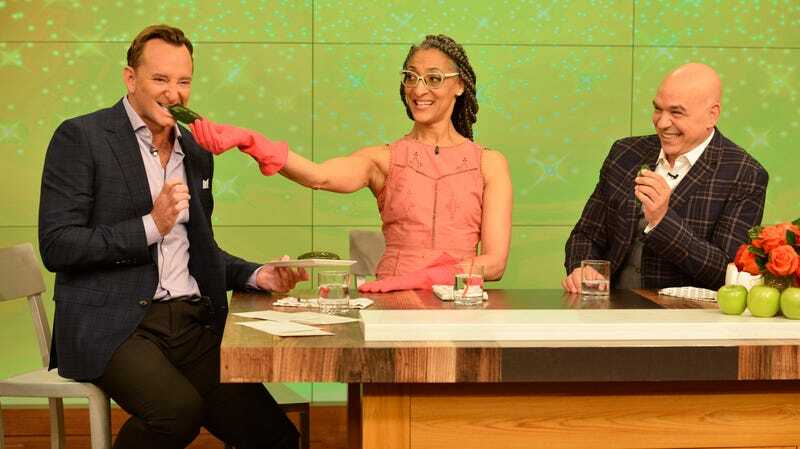 The Chew begins airing new episodes in June, but this particular batch will be its last. The news comes after the December firing of host Mario Batali, who we learned this week is under criminal investigation by the NYPD. No food puns here, as that particular element of this story is deeply upsetting, to say the least. If you’re a fan of The Chew, I’m sorry for your loss. Clinton, Michael, and Carla aren’t likely to be out of work long, so you can take some comfort in that. If you need yet more solace, perhaps tackle one of the show’s recipes — Carla’s Peanut Butter Bacon Banana Ice Box Cake sounds like it might do the trick. Whatever you choose, skip the pizza dough cinnamon rolls. Will chefs&apos; misconduct affect the way critics review restaurants?